How can we put this knowledge of God's will to work for alchemy and for change in our lives? And when you have asked, go about your daily duties. You will find that in the alchemy of the day—in its unfoldment, in the blending of forces, in the movement of your mind with the mind of God—God will reveal his will not so much by a spoken word but by the very action of his Spirit in and through you. God's will is like the unfolding rose. It unfolds like a spiral, and we come to understand it proportionately as we keep ourselves attuned to the mind of God and as we keep active, doing the best we know how to do each day for him, for our family and for our community. How can we put this knowledge of the will of God to work for alchemy and for change in our lives? The will of God is power. When you are aligned with the will of God it is as if you and God were each a colander: you put the two together, you get the holes lined up and then the cosmic energy of the universe flows through those holes. You find yourself literally charged and bristling with God's energy. As soon as you are out of alignment with God's will, it is as if your colander had moved, causing a total block to the flow. You don't know what to do with yourself and you don't know what to do with your life. Saint Germain reveals the path of freedom and how to get back into alignment with the will of God. Saint Germain's guru is the Great Divine Director, whose causal body contains the energy concentration for divine direction. In other words, he keeps the flame of divine direction for life on earth. 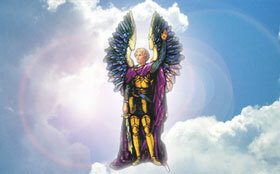 It is from the Great Divine Director that Saint Germain learned the alchemy of self-transformation. Saint Germain teaches us how to give certain mantras and decrees to the flame of divine direction held in the heart of the Great Divine Director. By doing a series of these mantras and decrees daily, we can come into a greater alignment with the cosmic consciousness of the Great Divine Director. I would encourage those who are seeking divine direction, the will of God and the alchemy of self-transformation in their lives to read Saint Germain's teachings. OK, once we have identified the will of God and made up our minds that it is going to be our will, what's the next step? Things really start happening when you decide that the will of God is the center of your life. 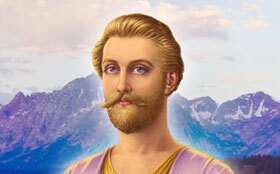 Saint Germain tells us that since his ascension he has maintained contact with one or more lifestreams on earth. He talks also about Jesus visiting his disciples even in this age. The moment you can say, “Not my will but thine be done,” with a full understanding that you have free will to accept or reject God's will, you realize that that is all the ascended masters are waiting for. When you accept God's will as Jesus did in Gethsemane, immediately an angel comes and ministers unto you as the angel ministered unto him. Alignment with the will of God is what will give us conscious cooperation with the invisible world and with the invisible hierarchy. Saint Germain tells us that “the creation of the visible is wholly dependent upon those essences that are not visible to the unaided eye.” This is an important point in alchemy. 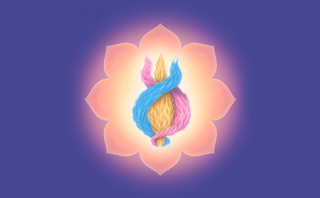 It means that to draw forth from the Universal, from the energies of Spirit, we must be able to visualize these realms and establish contact with them. Because we have not yet mastered time and space, we do not come and go in infinity as the ascended masters do. However, we have need of the energies and resources of infinity to take dominion over the earth. And so, the next best thing is to make contact with those who have access to those resources. When you need money, you go to the bank for a loan. So, Saint Germain says that in the process of alchemy we should follow the path of what he calls “enlightened self-interest.” Enlightened self-interest is interest in the Self, the Real Self, the God Self. He explains to us that this is not selfishness but it is actually doing what is best for and good for the Self. He says that unless we pursue this enlightened self-interest we will never be able to do the things that Jesus did. Before Jesus became the Master of Galilee he studied these very laws of alchemy in the retreats of the Great White Brotherhood. Having mastered them before taking embodiment, he brushed up on this sacred science before beginning his mission. Jesus then became the greatest alchemist of all time. We practice illumined obedience when we seek to understand God's will, to know that it is good and that it is really the foundation and structure of our identity—and by conscious free will we accept and obey that will. Obedience does not mean that one becomes a zombie, a puppet on a string or a jellyfish. The goal is to become a strong individual and then to yield that strength to the creativity of the mind of God. Mrs. Prophet, some people use their subconscious minds to enhance their creativity. What does Saint Germain have to say about this? Let the sincere student who would ponder and practice methods of mind and memory control, which are the methods of God himself, acquire the habit of consciously giving to the blessed Higher Mind, or Christ Self, the responsibility for designing and perfecting the embryonic ideas and patterns of his creation. Many of these patterns which at first appear to be consciously conceived by the alchemist frequently have their origin within this higher portion of the blessed Self. He explains to us that twenty-four hours a day the Higher Mind is active in expanded dimensions. We are not always aware of what this Higher Mind is doing. But if we meditate upon something that we desire to draw forth, even wisdom itself, and we release that as a matrix into the Higher Mind before we retire at night, then in the morning we can be filled with inspiration and divine direction. Saint Germain counsels us that it is important as we pursue his studies in alchemy to have a pad of paper and a pencil next to our beds so that if we are awakened in the night we can write down immediately what we are thinking and what the Higher Mind is impressing upon us. Otherwise, invariably we will not remember in the morning. This is because those moments, which often occur in the middle of the night, are moments of a higher contact and an experience in higher consciousness. Many times we say, “Well, I'll pick it up in the morning,” but in the morning we do not remember because we are not capable of sustaining in our full waking consciousness the contact with the Inner Mind. 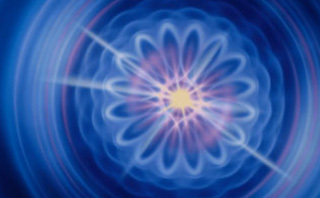 We find that the Great Alchemist himself, God the Almighty One, is working in and with and through our soul—from the superconscious mind, the highest source, through the conscious, subconscious and unconscious levels of our being, which contain the memories of our past achievements, even from previous incarnations. Alchemy, then, becomes the science of a total integration of the soul with the forces of her own microcosm, her own being, as that being is in contact with the one universal Source. First design a mental matrix of the desired object, then determine where you wish it to manifest. If you know the material substance of which it is composed, memorize its atomic pattern; if not, call to the Divine Intelligence within your Higher Mind to register the pattern for you from the Universal Intelligence and to impress it upon your memory body and your mind. Recognize that light is an energy substance universally manifesting on earth, thanks to the sun center of being, the focal point of the Christ in this solar system. Call for light to take on the atomic pattern you are holding, to coalesce around that pattern, and then to “densify” into form. Call for the multiplication of this atomic structure until molecules of substance begin to fill the void occupying the space in which you desire the object to appear. There is a core of information in Saint Germain's writings for the individual who perceives himself as a part of the avant-garde who will carry earth's evolution from the old order to the new. The symbol of this new order of the ages sponsored by Saint Germain is the eye in the capstone of the pyramid, which appears on the one-dollar bill. That eye is the All-Seeing Eye of the inner alchemist, your own Higher Mind, your own Real Self. When you make contact with that inner eye of God, you can precipitate the great pyramid of Self and find yourself one with a cosmos.